Thursday, October 15 1908 -- Herriman congratulates the new world champions, the Chicago Cubs, on their victory over the Tigers, and Bill Desmond's around the world hijinks continue. Here's an interesting feature from Carl Anderson, who is better known as the creator of Henry, much much later in his career. In the late 1890s there was a highly popular series of stories published about a British burglar and safe-cracker named Raffles, whose adventures were supposedly chronicled by his pal Bunny. Raffles and Bunny were the creation of E.W. Hornung, who came up with them as a sort of photographic negative of his brother-in-law Arthur Conan Doyle's literary creation, Sherlock Holmes and Watson. 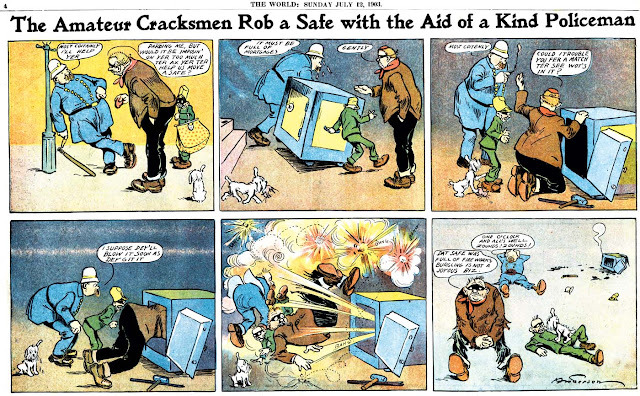 Why Carl Anderson felt it was within his rights to appropriate the names of these popular characters for a 1903 strip series about a couple of thuggish Brooklynites is anyone's guess, but steal them he did. The New York World seems to have not batted an eye over the misappropriation either. The strips feature the dim-witted duo plus an even more brain-dead cop who aids and abets them in their criminal activities. A cute dog is the final character, his sole role apparently to get kicked by Bunny in each strip. A bit of interesting slang in evidence here -- I had no idea that "crib" as a reference to a home was this old, but a trip to the dictionary reveals that usage dating back to the early 19th century. A "policy house" is a betting parlor, specifically one in which numbers games are the feature attraction. Raffles and Bunny the Amateur Cracksmen ran in the New York World's Funny Side comic section from February 15 to October 4 1903. It has long been my belief that the most important and interesting cartoonist memoir ever published is that of Walt McDougall. Titled "This Is The Life! ", it was published in 1926 by Knopf, at a time when McDougall was struggling to find work in a profession that he had practically invented in the 1890s. Though the occasional touch of bitterness shows through in the book, as is to be expected, McDougall in the main does a wonderful job of giving readers an exciting and insightful look at the early years of the newspaper cartooning profession -- a profession in which he had a key role over and over again. For many years I have have yearned for a chunk of free time in which to produce an index of this book. McDougall's publisher failed to provide one, and the author's habit of jumping around in his narrative makes it practically impossible to locate specific references without one. Since the book is so important, covering information not to be found anywhere else, this has often been a source of annoyance. I can't tell you how many times I wished I could refer to the book for some specific fact that I suspected was lurking within. Recently I found that the book had been digitized and is available on the Hathitrust website. Unfortunately, the OCR work, while quite good, isn't perfect by any means, and thus is still not quite the reference I'm yearning for. However, since that website has done quite a bit of the work for me, I decided it was only fair that I meet the book halfway, and do the necessary proofreading and reformatting to turn it into something approaching a proper eBook. Because I'm a glutton for punishment, I also decided to add links to further information when appropriate. I'm in the long slow process of working through this book (330 pages!) as we speak, and I will bring it to you here on the blog as I make progress. Perhaps this will become a regular weekly feature for awhile. Not sure about that yet, as I need to better gauge the amount of work necessary. As my life is quite stupendously busy right now, I can make no guarantees. Here, though, we start off with roughly half of chapter one of This is the Life! Enjoy! At sixty-five one is clearly far too young to be reminiscent. In the first place, his perspective is still too limited, events are too recent to have proper coloring and atmosphere, prejudice has not yielded to judgment and reflection, and in the second place, many persons are still alive of whom stories are to be told but whose feelings might be hurt. This last consideration has always prevented me from writing certain surefire hokum in fiction. I was aware that the originals of some striking characters would instantly recognize themselves, and feared that others might do so as well, and that many inexplicable happenings in the distant past would be traceable. To reminisce one should be heartless and also secure. But if one waits too long one's memory becomes treacherous and unstable. When a man finds himself groping vainly for the name of one who had been for years a daily companion in the long-ago, when he forgets the name of a hotel in which occurred the most tragic of incidents or of the ship in which he was wrecked thirty years ago or why he has always hated a certain person, it is time for him to be making notes, at least. It is at this stage, however, that the mind more readily gives up its stores of memories of the earlier years. It swiftly forms pictures of places and persons long since faded into blankness and restores to lively animation images that have been forgotten for scores of years. One can visualize the street in front of his childhood home more vividly than he can the plan of the flat he occupied four years ago. I can recall the name of the boy who used to sprinkle the sawdust on the barber shop floor in Newark when I was ten years old but I have already forgotten that of the Colonel with whom I played chess daily at Camp Meade in 1918. Therefore I feel that I had better begin before I forget matters of real importance. Much must be forgiven to one who seriously tries to write an autobiography unless he is among the great figures who have been of use to the world; the vanity that spurs him to the task, the self-esteem that attaches importance to his slightest deed or thought, the fatuous urge to place his book among the countless dusty volumes cumbering library shelves, these are human weaknesses which, fortunately, need not annoy us for a moment because we do not have to read his book. Such books by such writers are of value as textbooks in the study of egoism, and the more pronounced the egoism, the more valuable the book. Perhaps only to the creative artist is it fully given to realize how trivial and futile are the little successes of Life. He who is conscious of falling far below his aims, of reaching merely the foothills of the cloud-capped peaks of his early ambition, is never heartened to tell of his stumbling career, but if his story may ease the journey for other travelers or shed light upon the path, its telling is not in vain. Just as some have refused to be honest and have gone to jail, some have refused to be virtuous and wedded great wealth, others refused to be editors and have become Ambassadors, so have I refused to take myself seriously, and having thus placed my own valuation, I could not, out of mere self-respect, accord better treatment to the other bubble-blowers about me. Therefore, if a hint of levity or a lack of veneration for dignitaries be observable in these pages, let it be remembered that from childhood I was accustomed, like the animal-trainer's son, not only to seeing the lions perform in public but at their feeding-time and in their hours of relaxation. Having inherited a talent for drawing quite common in the family, it is likely enough that early attempts at caricature being applauded instead of reproved, awakened a childish vanity and created the desire to obtain a laugh and thus, with nobody warning or restraining me, for in our highly respectable family such a thing was unimaginable, I gradually developed into a scoffing, contumelious cartoonist. This not unusual talent, however, was accompanied by a most singular and inexplicable, almost uncanny faculty for being, by pure haphazard, in the vicinity when any fatal accident or important event occurred. A list of such fortuitous occurrences drawn up to prove this assertion would tell a tale of horror comprising murders, lynchings, burnings, drownings and the like, as gruesome as it would be useless, but this mysterious faculty has persisted throughout my lifetime, and came to be regarded by me as something as natural as a mole or a grocer's bill, coming to be static and dependable, so to speak. While it has made me less painstaking, perhaps, this confidence in blind luck has saved me untold worry and postponed senility materially. I was born in 1858, in Newark, N. J., and about ten years later the President of the United States, Ulysses S. Grant, took me in hand and, recognizing qualities not yet discernible by parents, teachers or companions, with one prophetic sentence planted in me a firm, enduring conviction that I was destined for great things, along with a deep-seated aversion for hard work. The exact date of this memorable event may be found by ascertaining just when President Grant drove the famous Dexter around the track at Waverley Fair Grounds, a couple of miles south of Newark. I was there with about half the boy population, but every incident of the day is forgotten except this historic happening. Loitering back of the judge's stand, a circular structure, the vast crowd blocked my view except aloft to this bird-house wherein I knew the President and a number of notables were watching the races. An enclosed stairway led to the upper platform, supported by a three-inch post, and urged by Destiny and exuberant vitality, I amused myself by climbing up this support. Reaching the platform, I was, of course, checked by the paneled balustrade and slid down, but on a third or fourth attempt I looked up to find a bearded face looking down upon me with kindly amused eyes. A hand was extended to me and raising mine, I was drawn up and lifted over the balustrade. "You'll get up in the world, my boy!" said the bearded man as he set me down. Every eye in the judge's stand was fixed upon me and I expected an instant expulsion, but a pleasant grin upon the handsome face of Patrick Quinn, the Secretary of the Waverley Association and a friend of my family, gave me some confidence. I stared eagerly about me but saw no face resembling the well-known one of General Grant. After a moment, Congressman Courtland Parker, also a family friend, asked me with a teasing smile: "Who are you looking for, son?" "Why, I'm looking for General Grant!" I stammered. "I thought he was up here." What he replied I cannot recall, but there was a general laugh following it, and in my embarrassment I turned about toward my introducer as a refuge. Instantly I recognized the familiar face, but wreathed in a broad smile. The shock was such that I bolted down the stairway, unlatched the door and fled. Before I reached home I was highly exultant, but when I told my story my mother was deeply mortified by such unseemly conduct and insisted that I write the President an apology. Poor mother, with six boys to guide, had none as erratic as I, and she feared that my little adventure would get into the paper, but, unfortunately, it didn't. One day in '86 I went with James Kelly, the sculptor, to Grant's house in 65th Street to watch him make some sketches for a battle monument he was designing. I asked the General if he remembered driving Dexter at Waverley. He said that he had driven the horse several times but did not recall the name of the place in New Jersey, and he was highly amused when I related how he had uplifted me and given me a slogan to live up to. Also, I told him how I had climbed up the steeple of the old First Presbyterian Church at the risk of my neck and with a narrow gouge carved the legend "Bound to Rise" on the ancient shingles. It may be there yet for all I know. Grant was then writing his memoirs and was suffering from the throat trouble that soon ended his days. He was far from being the "Silent Man" of popular tradition; he was, in fact, voluble, even loquacious to us two youngsters that day. On another occasion, when I made five or six sketches of his profile, which he kindly signed, he was taciturn, but we knew that he was suffering greatly. "You get out of here! I've shaken hands with you twice already!" "Why, I remember that little episode very well, but you've got it wrong. Didn't I kick you? Seems to me I did!" "You did not, General, but I deserved it," I replied. "I suppose it irks you to discover that you neglected an opportunity?" "Well! Well, I still think I did!" he insisted, grinning. "Anyway, I guess I knocked a lot of conceit out of you!" When I try to estimate how much time I have wasted at play, I marvel that I learned anything, yet probably that is why I am a husky old boy still playing outdoor games. At the age of nine I acquired a cavalry carbine captured from the enemy by a man who worked in my father's photograph gallery, a scarred and dilapidated breech-loader which I loaded from the muzzle with boyish disregard of life or limb, and tried to shoot flickers in the apple trees in our back yard. Always play with the maximum of risk! There was plenty of time for it then; the myriad things that children of today must learn had not been discovered. Geography was narrower by Africa, Australia, the Great West and Alaska, the modern torments of Arithmetic, Electricity, Physics and Grammar had not been invented and germs were inconceivable. I fell off a tall gateway upon a fence studded with long rusty nails, and hung there for a space with a nail through one hand and two through another, literally crucified. My mother simply wrapped up my hands in pork fat to "draw out the rust" and, strange to say, no trouble ensued, but if a woman adopted such archaic measures today the Board of Health would get after her promptly. Perhaps the germs of long ago were as slow and easy-going as the people. On another occasion, in my uncle's sash and blind factory, I put my finger against a circular saw in order to convince myself that it was moving. It was, and it took an inch of finger off. Picking up the fragment, I stuck it on and ran for the doctor, who was dubious, but at my earnest solicitation he stitched it on. It is there still with the plain marks of his workmanship visible. At that tender age an older boy tattooed a big blue star on the back of my hand and mother pumice-stoned it out, with suitable remarks about my vulgar tastes that were as painful as the operation which removed about a quarter-inch of cuticle, yet no other than a temporary inconvenience resulted. I learned early to ride a horse. To the team that hauled the overloaded street cars up the steep grade of Springfield Avenue was always added an extra horse just opposite our door. The boy who rode this horse, who afterward owned most of the stock in the trolley company, was exceedingly glad to let me take his place at any time. The horse was a fat steady old plug, but the skill and agility needed to hook him on to the swiftly moving street car made the job strenuous and exciting for any boy. As the old steed struggled up and then galloped bravely down the steep hill paved with rounded cobblestones, great flocks of swallows skimmed low along the roadway's center. The boys used to stand with slats to swat them in passing. Years afterward I learned that a century or so before this a wide shallow stream had flowed down this slope, afterward being covered over and converted into a sewer. A sample of the persistence of race memory. For generations the swallows had continued to haunt the course of the vanished stream, skimming the cobbles precisely as if the water still rippled in the Spring sunshine. Perhaps the insects upon which they fed were also the victims of the same instinctive habit. Market Street, where I was born, now one of the most crowded thoroughfares of the world, was then a grass-grown avenue down which frowned a courthouse built in the somber Egyptian style, similar to the famous Tombs, New York's prison, which was precisely opposite my birthplace, a house erected about 1797 by my grandfather, Hugh McDougall, a pious Presbyterian who organized Newark's fire department and was its first chief. The house was an immense one, with a broad porch and wide steps, and strangers frequently took it for a hotel, unceremoniously invading our dining room to demand board and lodging. On the day after Lincoln's assassination the wide space of street was thronged with tearful people gazing reverently upon a half-finished portrait in oil which my father had been painting and which mother had placed over the front door and draped in black cloth. This, very likely, is my earliest recollection of an event of importance. Our house had always been the resort of notabilities, I am convinced. It was in its atmosphere. Father, a successful and popular painter of miniatures and portraits, knew everybody in New York worth the knowing, and in those days the eight-mile journey to Newark had no terrors for the sturdy heroes of the stage or the brush and pen. Grandfather's diaries record that he often walked across the meadows to see the girl he afterward married in Newark, and mention that once he and another gallant removed their handsome expensive boots from motives of economy and made the journey bare-footed. A broad hall ran through to a stairway wide enough for the traditional coach to pass up, large fireplaces were in each room, with square openings in the walls through which the heat circulated, and in the rear was a long apartment the floor of which sloped earthward with its burden of years, which served as a battle-ground, a ballroom or a bowling alley, as our will dictated. The moss-covered roof slanted down to within a few feet of the ground at the rear, and a roll down this velvety green slope upon a pile of hay held never-to-be-forgotten thrills. I once slid down the front roof, caught by accident on the copper gutter, and was rescued by the nearby fire company. Far into days of manhood my fancy carried the dimming memories of that old house with its cavernous cellars, its dark shadow-haunted garret and many rooms, placing therein the locale of every scene and character in fiction from Grimm's Fairy Tales to Dickens' works, and through its halls and chambers have moved the forms of kings, crusaders, pirates, scouts, knights and giants, from the valorous Cid el Campeador down to timid Oliver Twist, until at last Time blended them all in a misty haze. A Doctor Dougherty, called away to war, had left in father's care a finely articulated skeleton, large and marvelously white, in a glass case which was placed in the garret back under the eaves and safe, it was supposed, from sacrilegious hands, and there it rested for a space. The familiarity that breeds lack of consideration gradually converted the ghastly object into a plaything. We used to take it from its case and treat it as if it were a giant doll, christening it "Jeff Davis" and hanging it over the second floor railing, in the absence of our elders, hauling it up with more or less care in case of an alarm. I have often marveled that its thin bones and thinner wires survived our rude handling. One day a servant whose presence in the house was unsuspected stepped into the hall to encounter the grisly Jeff doing a Dance of Death in the gloom like a great marionette. Her shrieks subsided into a fainting fit, but not before she had seen the awful apparition dart hastily upward, and her subsequent testimony swiftly led to our conviction. We youngsters felt the loss of this unique plaything keenly, even more painfully, perhaps, than the loss of a relation would have affected us; we often used to regret that we had been unable to have kept a finger-bone or a bit of vertebra as a souvenir of those hilarious hours. Probably this early intimacy with Jeff Davis created in me the ambition to be a great surgeon, which endured until I was about fifteen; at any rate, a skeleton never meant any more to me than any other highly instructive object. I will wager that since the Stone Age no human bones ever furnished so much innocent happiness to a group of gentle and refined children. To the old Market Street house came many famous men and women. Horace Greeley was a frequent visitor. In our games of mimicking our elders, he who first secured an ancient beaver hat once belonging to grandfather and put it under his chair, played the part of the great editor. One day father came into the house to find Greeley reading a newspaper with his feet stuck into one of the square ventilation holes in the wall. "Take your feet down, Horace," he counseled. "No heat is coming in there. There's no fire in yonder and the windows are all open." The editor held up his hand, felt the icy draft and snapped: "Damn it! Why couldn't you have kept your mouth shut? I was just getting nicely warmed!" Squier, ex-consul to Peru and author of "The Serpent Symbol" and other phallic works, with his beautiful wife, afterward the well-known Mrs. Frank Leslie, were visitors there, and it is supposed that here she met the engraver and publisher, Leslie, with whom she later eloped, creating one of the liveliest scandals of those days. When I met her in her old age, fat and faded, yet patronizing and dictatorial, there was no evidence of the beauty that had compelled my father to paint her portrait in miniature. Not long after she married Sir William Wilde, I happened to be walking behind a squabbling old couple on Fifth Avenue who, I judged from their conversation, had been banqueting freely and were having a slight difficulty in making the grade up Murray Hill. When like a good Samaritan I lent an arm to each for a block or two, I was delighted to discover that the two pugnacious old sports were the bride and groom. Henry Ward Beecher was another guest, and we children now and then spent summer days at his Peekskill country place; once I remember General George B.McClellan in uniform on the porch and my wondering if his horse would swim across the wide Passaic River beyond which he lived in an imposing mansion. GeorgeArnold, the gentle poet whose great ode to beer has always seemed to me a perfect poem, Edwin Booth, Tom Hamblin the famous, manager, Henry Clay, John McCollough, and John C. Calhoun are names often mentioned by parents and brothers as visitors to our home, but of none of them have I any recollection, of course. Richardson of the Tribune and McFarlane, who killed him, were frequent guests. The Richardson Murder created intense excitement in1869. It would have attracted my attention even had not the principals both been known to me. Daniel G. McFarlane, moved by a suspicion of the unfaithfulness of his beautiful wife, shot and killed Albert D. Richardson on the steps of the Tribune office on Park Row. Among the witnesses at the trial were Horace Greeley,Amos J. Cummings, Whitelaw Reid, F. B. Carpenter, and Fitzhugh Ludlow. Elbridge T. Gerry, John Graham, C. S. Spenser and Noah Davis were among the eminent lawyers. The verdict of "Not Guilty" was the subject of much excited discussion for some time afterward. "That's the bullet that killed my father!" Clyde Gordon Yeadon was born in Bark River, Michigan, on July 13, 1909, according to a family tree at Ancestry.com. His parents were James Williams Yeadon and Mary Ellen Boutilier, both Canadian emigrants. In the 1910 U.S. Federal Census, Yeadon was the youngest of six children. They resided in Bark River where their father was a farmer. Ten years later Yeadon and older brother, Benjamin, who worked at a lumber camp, were in their parent’s household. They lived in Hudson, Michigan. A 1928 Grand Rapids, Michigan, city directory listed Yeadon at “127 Mt Vernon av NW”. He was a clerk at The Illustrated Service. The 1930 census said Sagola, Michigan was the home of Yeadon and his father, a widower. Both worked at the lumber mill. On June 5, 1931, Yeadon married Rose Mary LaCost at Crystal Falls, Michigan. At the time both were residents of Iron Mountain, Michigan, according to the Michigan Marriage Records at Ancestry.com. Editor & Publisher, September 4, 1948, profiled Yeadon and told of his early love of cartooning. A love of drawing, first fulfilled with strips of charcoal from burnt stumps, won him his first cartoon publication at the age of 11 in St. Ignace newspapers. He amazed lumberjacks and took a place among them as mascot by illustrating their stories as they told them. But there were rude shocks in store for him before The Mighty Bunyan took life on the pages of daily newspapers. At 16 he took a job in the slab-wood yard and put his first earnings into a correspondence course in cartooning. Opportunity knocked early—he thought. A Fond du Lac, Wis., candy company offered a $200 prize for the best cartoon. He tucked his drawing under his arm and went to the candy company to collect the prize. Yeadon felt he had lost face in his hometown. Joined a carnival and was soon made into a chalk-talk artist. When the ventriloquist quit the sideshow, Yeadon manufactured a dummy out of beaver board and took over. The show went broke and Yeadon was stranded. Back home in Michigan he tried again and again with his drawings. Rejection slips were the result. Then his mother died and Clyde, youngest of 14—eight lumberjacks and five sisters—took his father to his home at Iron Mountain. It was not until 1936 that Clyde was able to attend art school in Chicago. Meantime, he had acquired other responsibilities, a wife and eventually as many daughters as Eddie Cantor. After the second year of training Yeadon sold “Stubby [sic] and Trinket" to a New York comic book publisher. [Stubbie and Trinket were separate features. According to Who’s Who of American Comic Books 1928–1999, the characters were together in 1940s Dell comic books.] He drew this feature for 18 months. The firm disintegrated and Yeadon lost several months’ pay, but was not discouraged. He felt the publisher had given him his first real break. The 1940 census recorded Yeadon, his wife and two daughters in Kingsford, Michigan, at 308 Dickinson Boulevard. He was a self-employed sign painter. Editor and Publisher explained Yeadon’s interest in Paul Bunyan. He started drawing again. His attorneys said he could never get a trade mark because Bunyan was a legendary figure. But after the panel ran in series for a year in 40-odd papers, he got the trade mark and Bell Syndicate got the material. Mostly, his drawings gathered dust in his Iron Mountain workshop, where he produces the polished continuity of today. He needed publicity. So he discovered the Paul Bunyan Diar-ee. It was found in Iron Mountain after weeks of search. Yeadon finally came upon it by following hodad tracks into a cave. It required 45 lumberjacks and boom and tackle to open the cover. Disappointment was supreme. The diary was written in oomph-phang, a sort of baby-babble. It was at this juncture that newspaper stories on the diary led Les Kangas, then a University of Michigan student and now a public relations whiz, to Yeadon. Kangas could translate. Kangas could read oomph-phang. The combination is terrific, and The Mighty Bunyan received its final necessary accretion. Yeadon took a number steps to secure his cartoon creation. His Ol’ Paul Bunyan cartoon, printed in The Iron Mountain News, May 7, 1947, was copyrighted. Also in May 1947, he copyrighted two The Mighty Paul Bunyan strips. The Official Gazette of the United States Patent Office, May 18, 1948, showed Yeadon claimed usage of The Mighty Bunyan, since June 6, 1947, and filed with the Patent Office on September 23, 1947. 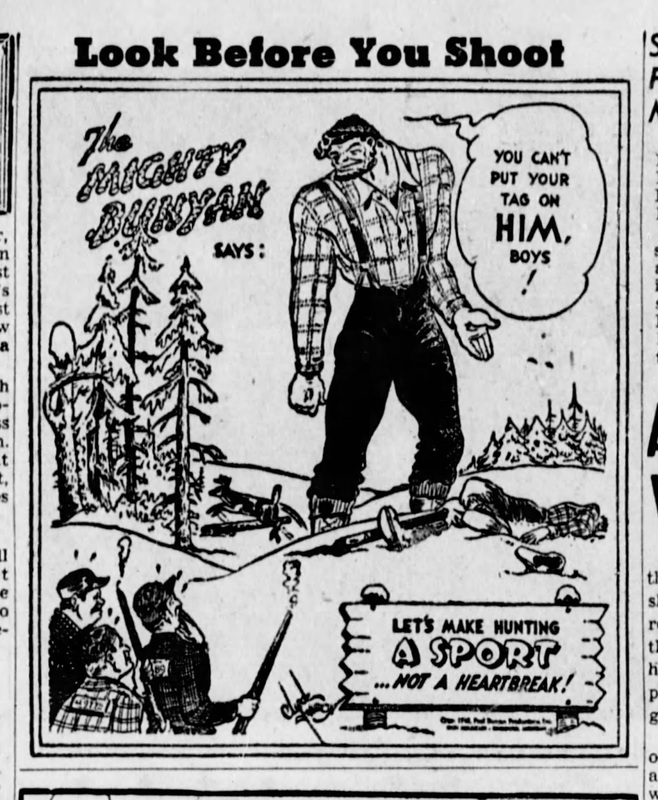 Yeadon made two more copyright applications, in 1948, for “Designs and plans for construction of proposed ‘Paul Bunyan’ figure.” and a drawing published in the Powers-Spalding Tribune, November 5, 1948 (probably the same one shown above from the Winnipeg Tribune). Editor and Publisher said The Mighty Bunyan dailies began October 11, 1948 in Michigan papers [Allan sez: but that date was probably wrong; see my post about The Mighty Bunyan]. The Mighty Bunyan Sunday ran in the Milwaukee Journal (Wisconsin) beginning February 13, 1949. (Enter 127 in the page box.) The Sunday strips were also copyrighted. Ger Appeldoorn has collected the Sundays on his blog. The family tree said Yeadon passed away July 8, 1955, in Iron Mountain. He was buried at Channing Cemetery, in Channing, Michigan. 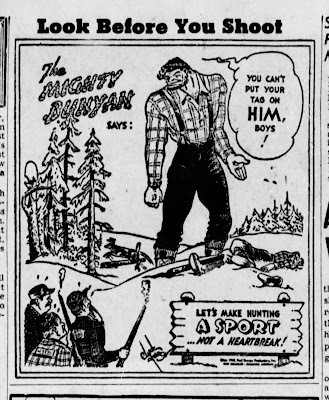 That legendary lumberjack Paul Bunyan seems like a perfect subject for a newspaper comic strip, so it is actually a little surprising that it took until 1949 before someone brought the idea to light. The Mighty Bunyan, by Clyde Yeadon, debuted on January 2 1949 in a short list of northwest state newspapers, distributed by Bell Syndicate. Clyde Yeadon didn't have a particularly distinguished career as a cartoonist, but you've got to give him points for coming up with the idea for a Paul Bunyan strip, and then hanging onto his brainchild tenaciously until he brought it to fruition. Based on newspaper and Editor & Publisher articles, we know that Yeadon had put together his likely one-man operation of Paul Bunyan Productions* shortly after the end of World War II. 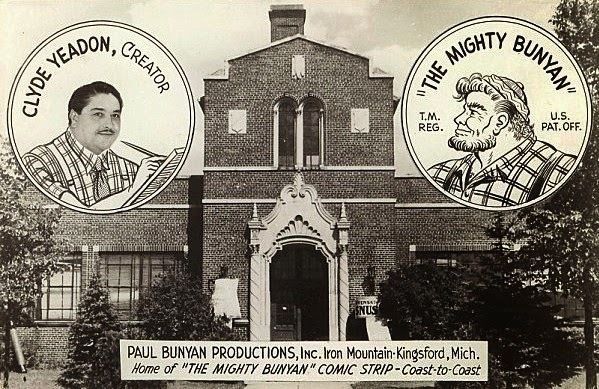 He tried to sell a Paul Bunyan cartoon in various forms, and may have self-syndicated an early version of what later became The Mighty Bunyan to a few Michigan papers (unfortunately I cannot come up with any direct proof that it really happened). He did at least get a few individual cartoons published featuring his character. 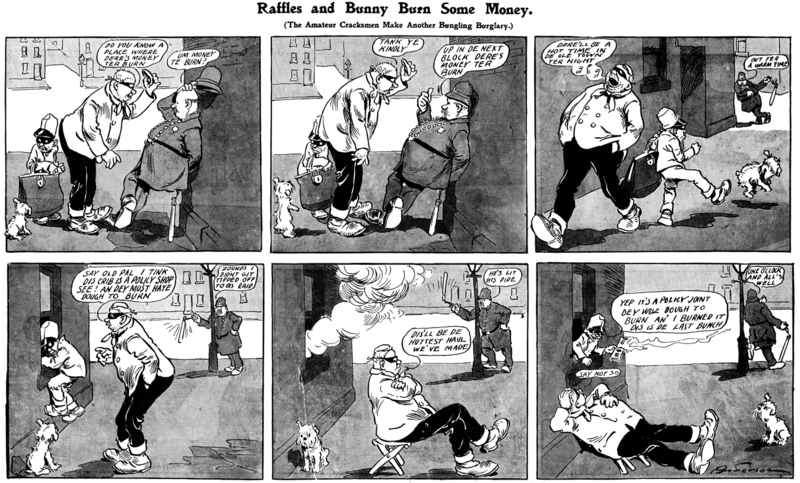 Though Yeadon's cartooning is pretty raw, Bell Syndicate evidently saw the hustle the man was willing to put into the strip, and probably figured it was worth a chance. Yeadon was a real go-getter, and probably did more to sell the strip than Bell ever did. Things were a little rocky from the start, though. After announcing the start date of the strip as October 11 1948 in E&P, something seems to have gone awry, because the actual start date ended up being the aforementioned January 2 1949. A Sunday strip, announced to start with the daily, ended up debuting on February 13, probably with the Milwaukee Journal as the only taker. When the Journal lost interest and stopped printing the Sunday on May 8, that appears to have been the swan song for it. Soon Bell Syndicate too was losing interest in the strip. 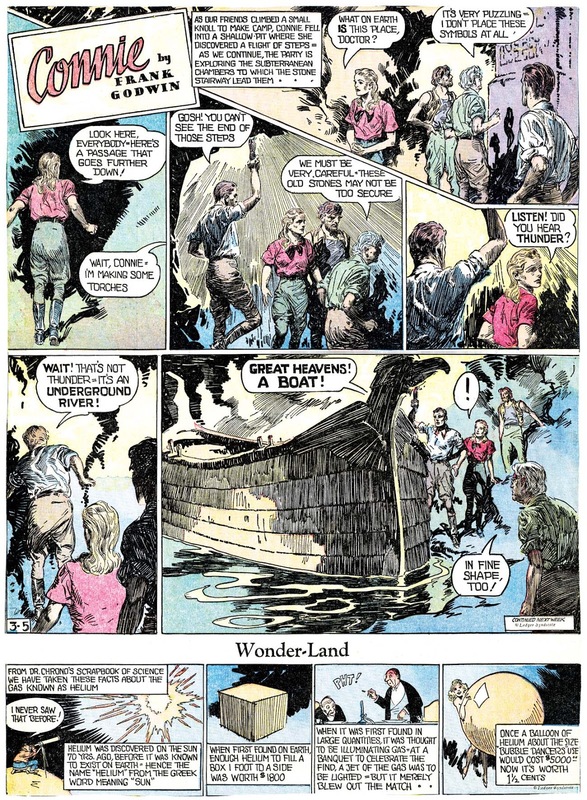 Starting on July 25, the strip no longer included the Bell Syndicate copyright slug, and seems to have been self-syndicated by Yeadon's Paul Bunyan Productions from then on. The strip's storyline, after a breakneck run through the classic legend, diverged into new stories devised by Yeadon. Unfortunately, he was not all that comfortable with telling a story in short daily spurts, and his plots tend to jump all over the place with storytelling gaps from one strip to the next. In fact, reading the strip you constantly have the feeling that every second strip must have gotten lost in the mail. While Yeadon obviously delighted in adding to the Bunyan legend with appropriate and theoretically entertaining stories, they were, quite frankly, not very well told. So despite his heart being in the right place, his market was limited mostly to newspapers that he probably sold to personally. The strip continued with its short client list until December 9 1950. Tomorrow tune in again for Alex Jay's Ink-Slinger Profile of Clyde Yeadon. * That's incorrect. Yeadon was assisted in the marketing of his Paul Bunyan cartoons by a promoter named Les Kangas, who was made president of Paul Bunyan Productions. This information is from Kangas's son, Les Kangas Jr. He was my grandfather. I have a few of his things still.